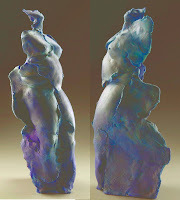 When I finished firing my series, only one stood out as fully embodying my concept of "Voyager" She moves into the ethereal plane fearlessly and wins the name for herself alone. It is a good thing to stop and smell the roses. Working in clay creates these intervals. Periodically I must step away and let my work dry out a little before I can push it further. Sometimes I take the pieces out to the garden so hurry the drying process. 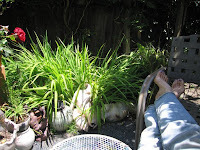 This is an important component because sitting among the perfection of growing things, I get a sense of organic order. I see that the energy of the plant moves ever upward in logical paths of balance and counter-balance. I can have no better template for art. When I am building a new piece, it's always a little breathless in the early stages. 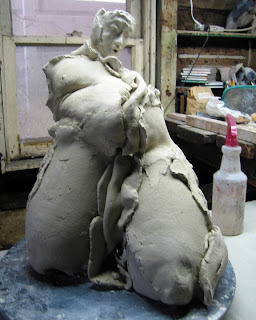 I assemble barely leather-hard slabs with no visible means of support and when the whole thing threatens to come crashing down, I start searching for what ever is within arm's reach to prop up the clay. This time it was a coffee cup and a kitchen knife. 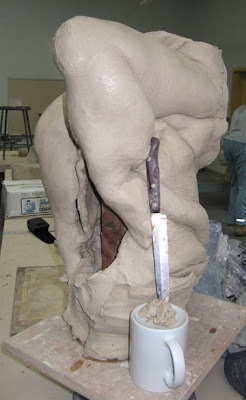 When I started sculpting, I was in love with pit fire and I have a large number of pieces from that stage of my development. The surface is spectacular! Every nuance of the open flame is captured. 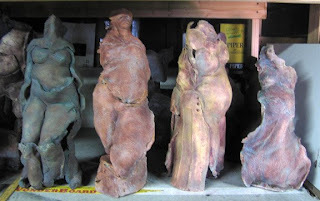 As my pieces got larger, I had to leave pit fire behind and because I no longer show them, I want to find good homes for them. They deserve better than gathering dust on the shelves of my studio. this Saturday, June 20th, I am having an adoption party. I will be giving away these exciting pieces to those who are interested in my work. Email me for details if you want to participate. 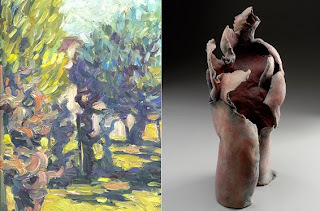 I just picked up my show at Quicksilver Mining in Forestville, when I put these ladies next to each other, I was struck with the degree to which I have experimented with surfaces over this past 6 months. I have used stains, oxides, underglazes, wax and even oil paint. I had the argument with myself about "pure ceramic art" and then I threw that concept out the window. For me it is all about the form and I will shamelessly use anything that gives me an exciting surface. 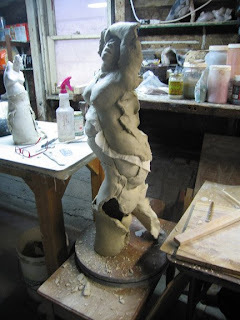 Big, for me is anything I have to do in segments because it's too tall for my kiln. This is my first piece that is taller than the 27" of my scutt. Because of the organic way I work, I can't just slice it up in the manner of Viola Frey. Instead, I have to come up with a solution that fits the open construction method I use. The paper towel marks the division between the two segments and I had to add a base to compensate for tipping. This turned out to be a BIG learning curve for me. Weight, balance, human anatomy all needed rethinking when I made this big jump in scale. 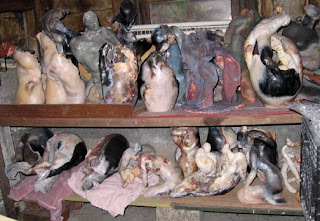 This is a shot of my work as it is seen in the exhibit space at Gladding Mc Bean factory in Lincoln, Ca. 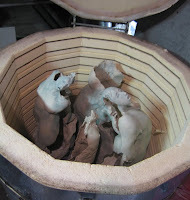 My piece was shown in one of the giant (and I do mean giant) beehive kilns on the ground floor. This place has been making large scale ceramic products for 130 years. They have the molds for all of the victorian trim used on big buildings across the U.S. and they continue to do restoration work today. 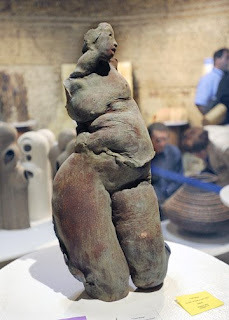 The only way to see the clay show is to tour the factory. Call Lincoln Arts at 916-645-9713 for reservations. It will be up until May 31. 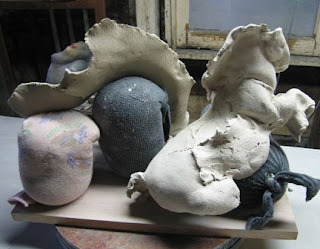 It has been 4 or 5 years since I laid down my paint brushes and started making clay sculptures. Sometimes, it's good to look back and see where one has been. The comparison is stark. 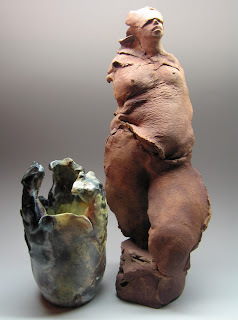 I started with a vessel form that "grew" figures from the wall. At some point, I realized that the wall of a thrown pot was really a slab if I opened it up. This was a great discovery. I started working with slabs exclusively and it changed my process completely. I could now work larger, exploring the pose and discovering how to make expressive folds. 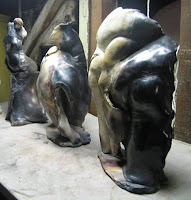 As my pieces got larger, I had to abandon pit fire as a surface effect because the pieces were just too fragile. oxides and under glazes are my main surface treatment now.